From its humble beginnings as a science-club offshoot of the long-shuttered Seaford Dupont nylon plant, the Minority Engineering Regional Incentive Training (MERIT) program has since blossomed into one of the state’s most successful postsecondary prep programs. 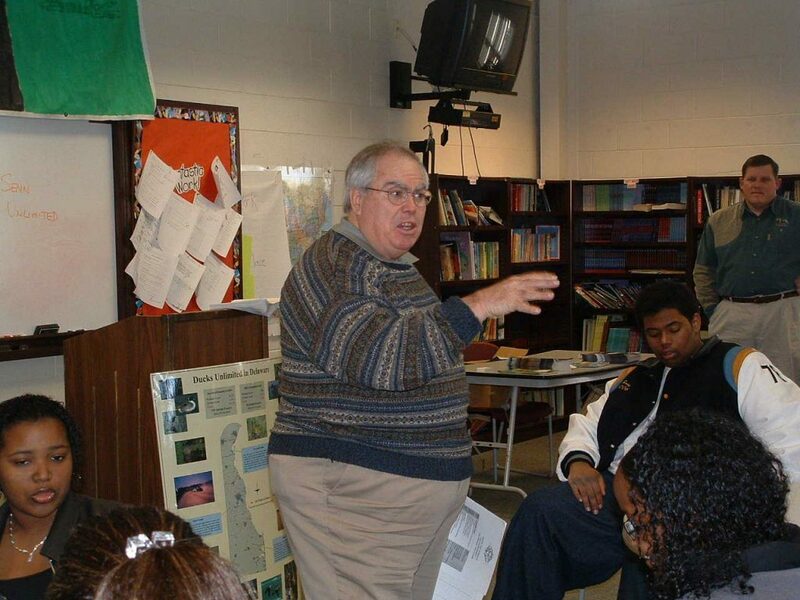 Its founder John Hollis—a former teacher and counselor—is still at it after 43 years, grooming young minority students from Sussex County to aim high academically. Of the more than 350 MERIT students, around 97 percent graduated from college. The program evolved from a small club during the school year to intensive summer programs, field trips, college campus visits, scholarship programs, alumni events, and more. There are STEM team-building engineering competitions—think fighting robots and wind turbine design contests—and partnerships with local colleges and Delmarva Power. We talked with Hollis about the MERIT Way, and much more. We’re 43 years into MERIT. What motivated the creation of the program? What challenge or need were you hoping to address? It was ‘74 when it started. I was approached by the management at the Seaford Dupont nylon plant, which was the world’s first and largest (at the time) nylon plant. There was a National Action Council for Minorities in Engineering group, and the folks at the Seaford plant wanted to participate. I was coaching and teaching science for the sons and daughters of the Dupont engineers, who all thought they needed an educator to advise and motivate these students. So we started with a science club aimed at local African American, Native American, and Latino children. We were addressing the disparity between a roughly 25-percent local minority population, but less than 1 percent of whom were matriculating into higher education in science and technical fields. That was our goal, to address that disparity. We got nominations and started a club. I had been a coach, counselor, and teacher since the 60s, so I knew that if we wanted to inspire these children to higher ed, we needed to develop the whole child, not just host them in a science club. So we started with Saturday morning meetings with a lot of science-based STEM programming—this was back before before STEM was invented. We had sixth and seventh graders and we had these great activities that were designed by Dupont engineers. I was getting my master’s and doing my doctoral work on motivational science, so I incorporated a lot of that theory with activities on things like time management. And before long, what started as a science club morphed into a total youth development program. We were helping these young people with motivation, goal-setting, time management, and more. And the program just kept evolving, right? If you told me back in in ‘74 that I’d still be doing it in 2017, I wouldn’t believe it. We now have meetings every other Saturday during the school year and three intensive weeks in summer. And over 35 years of pretty elaborate science activities. When the nylon plant closed, Delmarva Power became the sponsoring corporate entity. We’ve had several significant developments. At one point in the late 80s, I was concerned with this observation that many African American males lacked the motivation toward academics. So many wanted to be professional entertainers or athletes. I knew from being a coach that the chances of making it a career were minimal. There was a motivational speaker in Salisbury, Md.—a surgeon—who had just separated Siamese twins who were conjoined at the head, which had never been done before. That surgeon was an African American who grew up in poverty in inner-city Detroit, a “hoodlum” by his own description, who went onto became the youngest department chair in neurosurgery at Johns Hopkins. So I took MERIT students to hear him speak, and they were enthralled. And eventually I got him to come to the community, and invited his three sons to be part of MERIT. They came up from Baltimore and stay with me and [my wife] Linda during the summer. By 1994, Ben Carson had become such a fixture with us, we had established the Carson Scholars Club. What other developments have you seen? We’re aspiring to get first-generation children plugged into MERIT. Which is why we developed the Touch Greatness program, where we bring in scientists and motivators like Sam Beard, founder of the Jefferson Awards, to connect with these families. And our partnerships with Delmarva Power and others continue to grow. Recently we built wind turbines as part of a science experiment. We worked with University of Maryland Department of Environmental Safety, where they have 3D printers, to design the blades of a turbine. The UMDES folks then 3D-printed our designs, and Delmarva Power provided their wind farm where we tested them out. Three MERIT teams actually generated more electricity with their designs than the test designs at Delmarva Power. You talk about motivation. What, do you find, are key motivating factors? I think about Maslow’s Hierarchy of Needs—how natural and logical consequences are a powerful teacher. Encouragement is the vehicle to that environment. The motivation aspect of seeing goals, setting a bright picture of the future, and then the knowledge of, if you work, you get results. If you want to enjoy the harvest you have to first labor in the field. I was studying that theory, but then Ben Carson comes into my life and we now have a living practical example of a world renowned scientist, who went through this same process. He would envision himself as a doctor one day. We use the same formula to inspire kids. And it wasn’t just Ben—we recently had reps from six local colleges come visit us to describe the college experience to our students so that they could visualize it. Today we have over 30 former MERIT students who hold doctorate degrees. About 15 months ago I had a pretty severe stroke, and a lot of people assumed I would stop MERIT, because it’s a lot of work. Especially when you go to sleep at night not sure if you’re going to wake up the next day. But when a young man, who I remember as a not-that-motivated sixth grader, comes back with an M.A. from Wake Forest, that’s my motivation—knowing that I played a part. When a young lady who came to the U.S. in second grade from Puerto Rico not speaking English gets up on stage to get her bachelor’s degree in mechanical engineering from Virginia Tech, well that’s the big leagues. That’s my motivation. How can the rest of the state replicate what you’ve done to create opportunities for students? Step 1: When is the last time you were in some extended involvement with a child who is challenged by poverty or a lack of formal education by their parents? Don’t just talk about, get direct involved with students. Step 2: Become proficient in goal-setting. We set victory logs, and kids writing the good news they heard. Step 3: Empower parents. Get them directly involved. Step 4: Empower the community. Those engineers from Delmarva are blown away by what these kids can do. Step 5: Go learn from lessons of the past. Seek out those people who have gone through what your students have gone through and find their lessons. Do you think MERIT has influenced others in Delaware to carry on your example? I think of MERIT as where the rubber meets the road. We don’t dwell in theory, we dwell in results. As a result we’ve had 14 kids graduate from Ivy League schools. If you want to talk about how to break the poverty cycle, there it is.